Gas fireplace service Denver Metro as well as most Front range communities. The Gas Connection, Inc. has a fully equipped service department to diagnose service and repair your gas fireplace appliance. 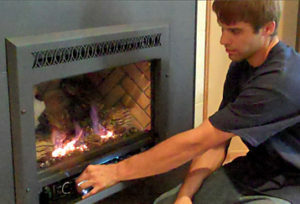 Regular maintenance on your gas fireplace, stove or insert will maintain the beauty and efficiency of the gas appliance. Our service team can inspect your gas fireplace appliance to ensure your comfort and safety during those cold winter months. In addition, we offer off-season discounts to keep your fireplace worry free. As with any other appliance in your home, routine maintenance should be performed to extend the life of your fireplace and avoid unnecessary outages. Our service team comes prepared with most stock parts for most standard fireplace appliances. Our trained service technicians can diagnose and replace any parts necessary to keep your fireplace in optimal condition. Please call today for pricing information. A standard service call typically takes about an hour (for an individual unit). We will initially diagnose the issues that the unit is having; perform a general service and cleaning; confirm that all parts are operational and check for both CO and gas leaks. Our certified service technicians would be happy to answer any questions about your gas appliance. In addition, they would also be available to go over remote operation, pilot lighting instruction and any other operational questions you may have. Trying to find a reliable gas fireplace service repair resource in Denver is not an easy task. The Gas Connection is a trustworthy, all-inclusive resource for everything related to diagnosing and repairing your gas fireplace. So whether you need help lighting your pilot light or need our service techs to diagnose a trickier situation, let The Gas Connection be your resource.